Room Alert 11E is one of AVTECH's hardware solutions for "IT & Facilities Environment Monitoring, Alerting & Automatic Corrective Action". It is designed specifically to assist with monitoring computer room temperature, humidity and environment monitoring in multiple locations up to 900' away. 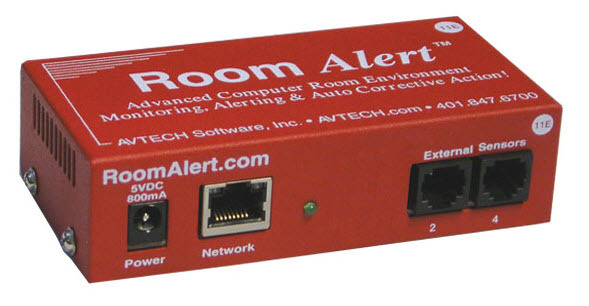 The Room Alert 11E package allows users to log environment sensor status for immediate alert notification, historical review and graphing. When integrated with iMCA System, you can not only remotely monitor devices reading environmental parameters such as temperature, humidity, vibration, flood, air flow, gas etc or state of objects such as doors/windows but also create virtual connections with any switches registered in the iMCA System such as static, pulse, IR, security arm or disarm etc. You can easily create and execute any number of automation scenarios based on time schedule or sensor information, without having to deal with any cryptic codes or learning a scripting language. Applications include - System Integration, Remote Low Voltage Power management, Automation, Enhance products with remote power control, Digital Signage, Lighting control, Climate Control, Power Scheduler, Security and many more. Easy Ethernet 'Plug and Play'. Includes a built-in digital temperature sensor. ncludes 1 external digital temperature/humidity and 1 external main power sensor. Includes 2 digital sensor ports and 8 channels for switch sensors or dry contacts. Power Source (Included): 5 VDC 1A Adapter. Digital inputs provide de-bouncing function.